Top Rated Food Tours & Services: 10,000 + Happy Eaters Since 2009! There is a buzz on the island that things are changing, the island is growing. Don’t be mistaken all of this is true. If you drive far back enough in town you will see a lot that has recently been bulldozed for the future home of Sam’s Club. As the landscape of this tiny Caribbean island continues to transform as do the types of tourists. Yes, Cozumel will continue to be home to many cruise ships and divers, but soon it will be the future home of those escaping life for their own personal transformation….cosmetic surgery vacationers. For the last two weeks in Cozumel the Telemundo film crew has been recording a promotional video in the efforts to boost attraction to Cozumel in the direction of medical tourism. The Cozumel Medical Center (Costamed), also known as the CMC hospital, has recently partnered with the company Gorgeous Getaways to offer cosmetic surgery holidays. In conjunction with this partnership, it has provided an opportunity for other businesses on the island to become a part of this growing industry. Gorgeous Getaways is offering full-service packages, including….chef service. During surgical recovery, the clients of Gorgeous Getaways will be able to choose a variety of guest services that are available on the island. During this promotional filming, Cozumel Chef was given the opportunity to showcase her culinary skills in front of the camera at the Landmark Cozumel, the renowned, newly developed ocean front condominiums. Cozumel Chef cooked a dinner in luxury. The kitchen was fully-equipped with beautiful KitchenAid appliances. The four lucky ladies who won this promotional Gorgeous Getaways trip indulged in a three-course meal while being filmed and interviewed. 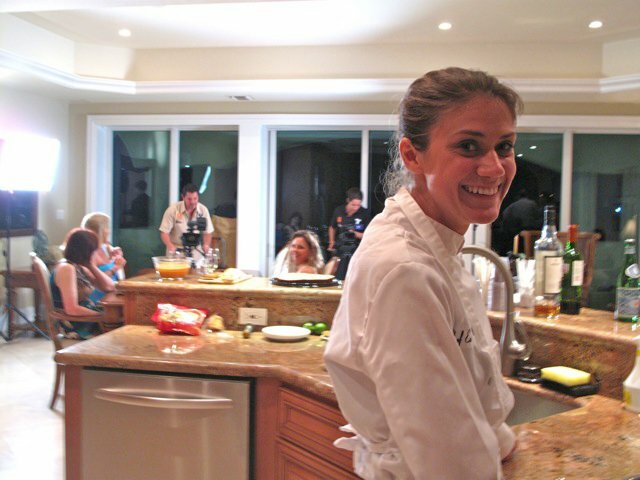 The chef also provided the Telemundo film crew and the supporting doctors, directors and those that helped orchestrate the event with a delightful Mediterranean salad, a cheese and fruit spread as well has a delicious roasted red pepper – white bean dip. The experience of being filmed was surreal, even though the chef may not get a “big part” in the edited video, it was non the less memorable. Light’s, camera, ACTION! Or as one Cozumel Chef fan put it….Limes, camerones, AQUACATE! This simple salad is special to me. Taught to me by the owner of The Hamilton Grill in Lambertville NJ, Jim Hamilton, he served this as an amuse in his restaurant for special clients…the kitchen calls it a “SMUSE”. 1. Drain and scrape bones from the anchovies. Lightly pat dry with a paper towel and set aside. 2. Sprinkle shaved celery onto a serving plate. Place anchovy filets randomly on the plate. Sprinkle plate with black olives, shaved parmesan, balsamic and black pepper. Serve immediately. I am going to miss you in Cozumel. I hope you come back! Thanks for reading! Emily, that was a great meal and I enjoyed it very much! I am happy that you enjoyed yourself! I had a great time. Quite a unique experience for all of us.